Creating a thoughtful experience for new users not serviced by Door Dash. Create a positive and thoughtful onboarding experience for new Door Dash App users who live in areas not currently covered by the service. The self-selected design challenge was inspired by my frustrating experience moving to Pittsburgh and found certain services no long available. I wanted to rethink this abrupt user experience and see if any thoughtfulness could be introduced. A redesigned interface featuring location-based content and call-for-action option that mediate confusion and negative brand impression. I observed four new Door Dash app users and one returning user while they verbally described their journey (think-aloud). I recorded users' full user journey from downloading the app to eventually giving up on using the app. I analyzed the video footages, captured screen changes and the corresponding think-aloud comments, put them on sticky notes, and organized them based on screen type. Following the observation, I studied three other popular food delivery apps: Uber Eats, Grubhub, and Postmates. I compared the new user's sign up criteria, the returning user's home pages (at different location than last time using the app), and the content included in the "out-of-service-area" pages. All three apps currently have different approaches for "out-of-service" notification. 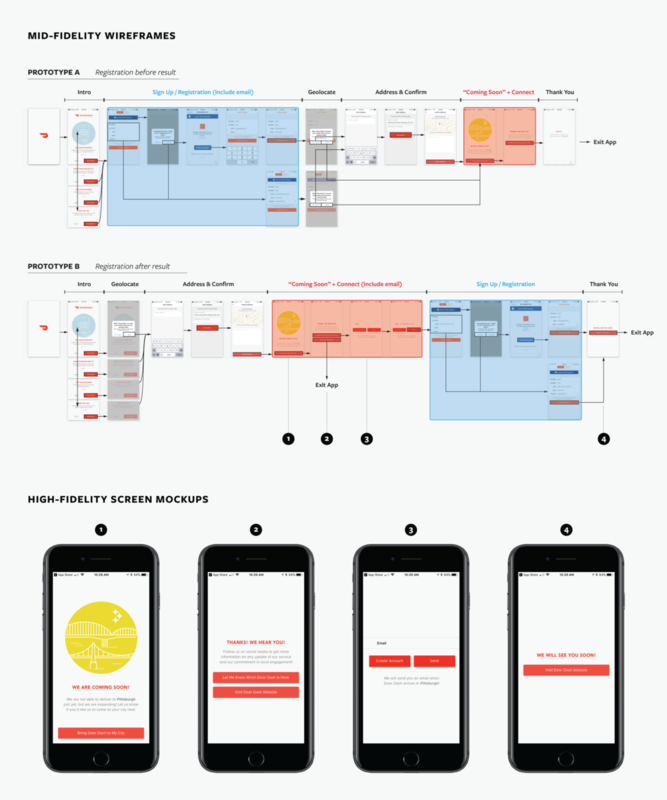 To get a better sense of how people may react to each approach, I made six low-fidelity prototypes of "Door Dash App", each with a mix-and-match of approaches of the three competitors. Due to the time constraint, I decided to focus on the experience of new users, as their current user journey are much longer and more frustrating. I then designed a survey to understand how users responded to the different design. Each survey participants was given six paper prototypes. 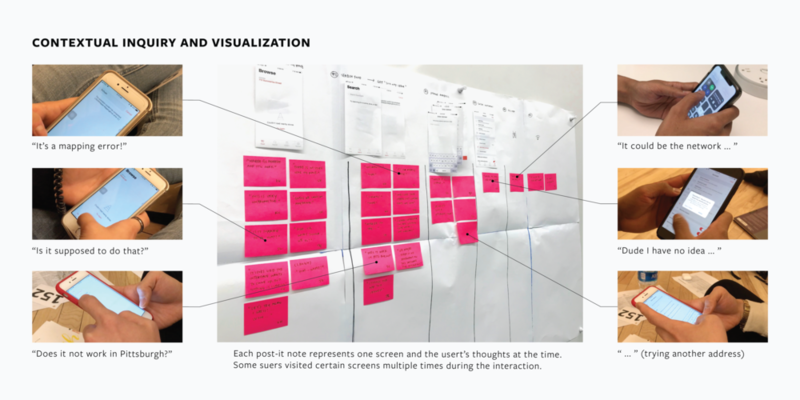 Below each prototype was a series of questions regarding the experience. The participants were encouraged to think-aloud or write down specific moments that they felt strongly about. At the end, the participants were asked to highlight their favorite and least favorite prototypes. A total of 8 people, mostly students at CMU, completed the survey. I used the quantitative survey data to compare individual features. For the qualitative notes and talk-aloud phrases, I sorted the answers to show features/emotions that came up repeatedly. All the studies and testing so far have been focusing on new users. But what about Door Dash? What immediately came to mind was the signup step – of course Door Dash wanted new users to sign up! The new users, however, very clearly did not want to without guaranteed access to the service. I created the Goal Diagram to show interests from both sides. It became clear that regardless of the success of service, both the users and Door Dash want this to be a delightful experience. In this exercise, I will use common interests (yellow area) as my guiding principles. Based on the research findings, I further developed the "Coming Soon" screen in high fidelity to incorporate the "personalized message" scheme identified in the survey. Knowing that "sign-in", an unfavored step for the end user, could be useful to Door Dash, I wanted to explore whether the "coming soon" screen improvement could balance the inefficiency caused by "sign-in" screen. I decided to run an A/B testing to evaluate the emotional response as well as users' time spent on the app. Prototype A placed "sign-up" before "coming soon" (existing app solution). Prototype B is reverse. In Prototype A, the sign-up/facebook sign-in screen is before the "Coming Soon" screen. In Prototype B, the sign-up/facebook sign-in screen is after the "Coming Soon" screen. The testing result sho very subtle difference between prototypes in terms of frustration. People did generally react much calmer to both prototypes than to the existing condition. I was also able to get feedback on the visual and content design – some wished for more specific informations on the "coming soon" promises. People also did not care much about the call-to-action function that the fact that it's a button to click. I took on this design challenge knowing that this subject matter is likely very low on the priority list for most apps and that there is likely not a perfect solution. I stopped at the A/B testing stage because it would be the most productive to bring this finding to Door Dash's market team and discuss how much Door Dash want to invest developing this interaction and what their goals for this interaction are. I do really like this project because it's always been my design goal to show thoughtfulness and respect for all users – even those who wouldn't use the service today. This quick design challenge only looked at very limited scenarios and tested on a few aspects of the user interface design. Moving on, I hope to explore more ways to express thoughtfulness – does Door Dash give personalized messages and timelines to pipeline markets? What are some other ways to approach future users?